Chestnut Street. Divided back octochrome post card; postmarked 1916. South Chestnut Street. Divided back octochrome post card; postmarked 1915. 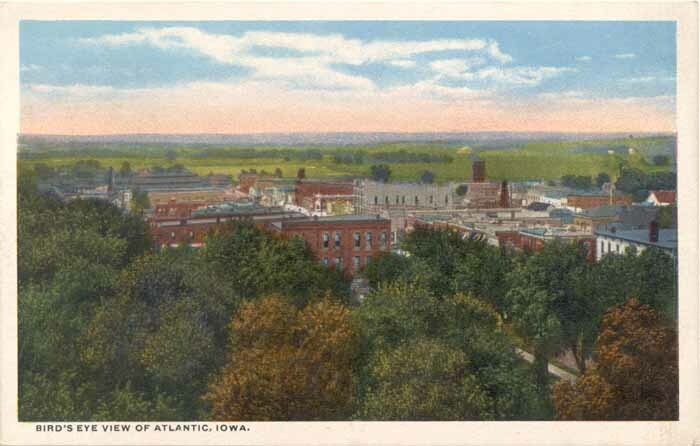 Bird's Eye View of Atlantic, Iowa. Divided back post card, unused. Chestnut Street, Looking North. Divided back post card circa 1907-1915 with message but no postmark. 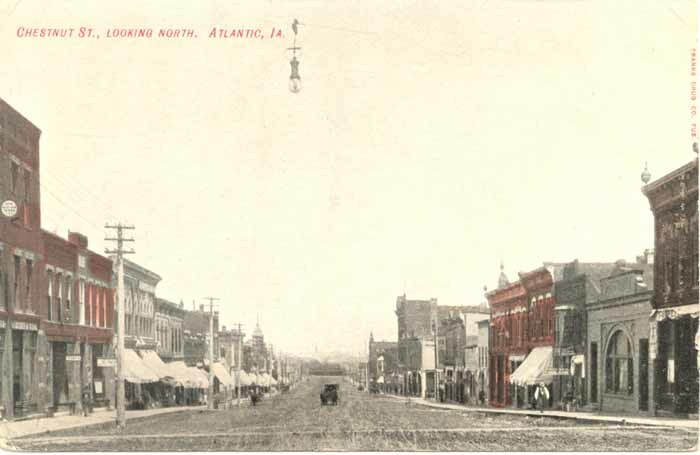 Message reads, "This is Chestnut street in Atlantic at the lower end you see the Depot. Come right on up the street and over the hill and we live on the west side of the street. H. E. M.". Chestnut Street, Looking North. Divided back post card, message but no postmark, circa 1907-1915. 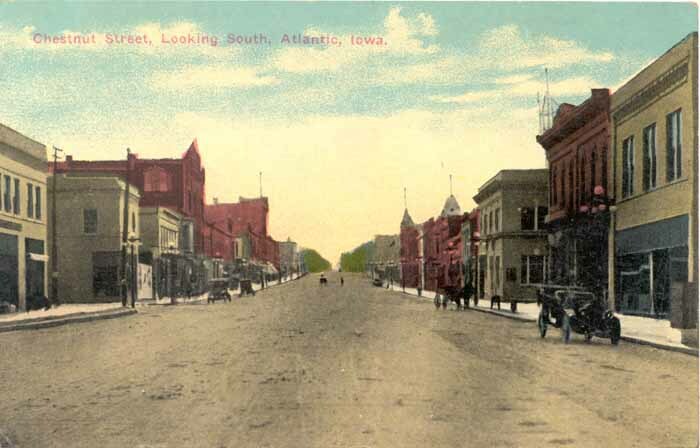 Chestnut Street, Looking South, Atlantic, Iowa. Divided back post card, postally unused. 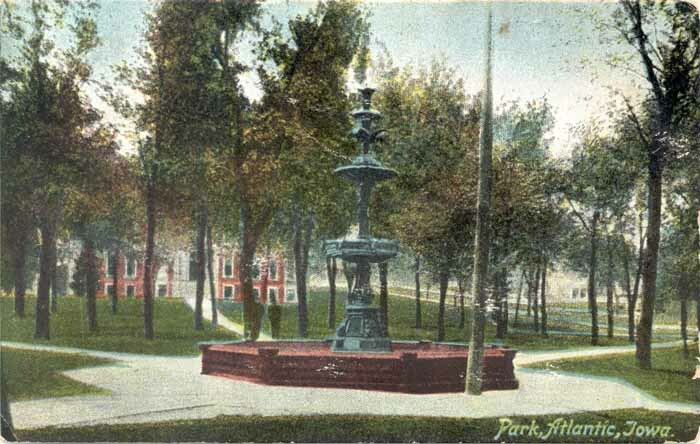 City Park, Atlantic, Iowa. 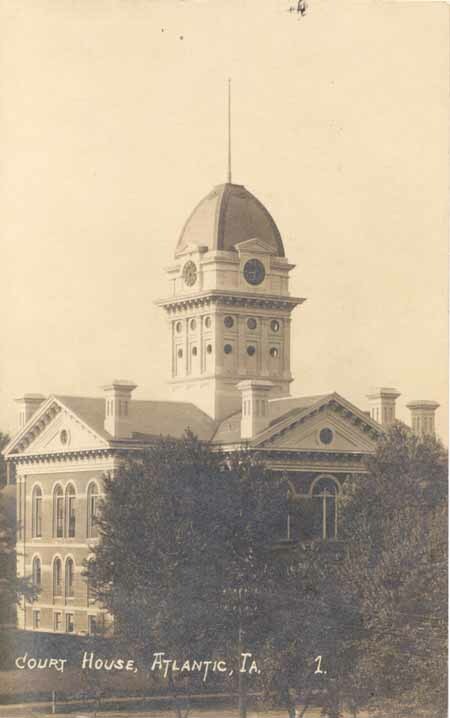 Divided back post card, circa 1907-1915. 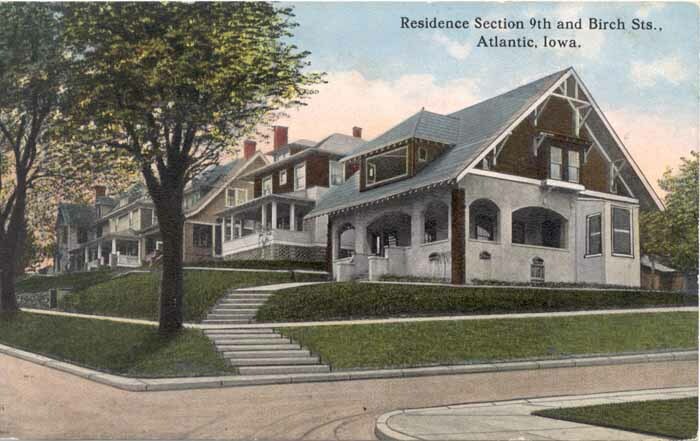 Atlantic, Iowa. 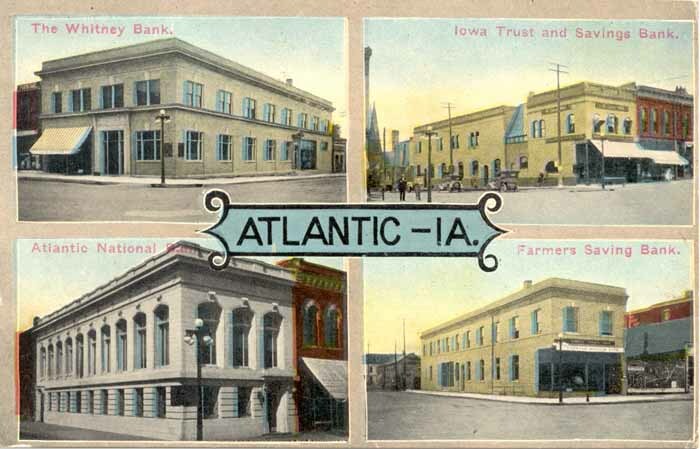 Four banks pictured: The Whitney Bank; Atlantic National Bank; Iowa Trust and Savings Bank; Farmers Savings Bank. Divided back post card, unused. 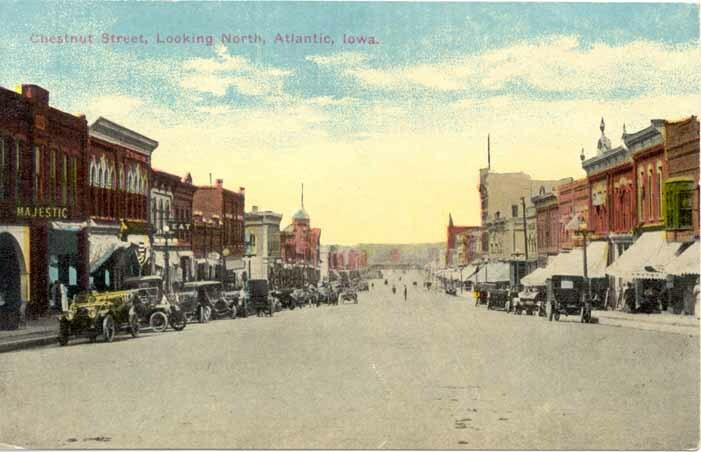 Street Scene, Atlantic, Iowa. Divided back post card; postmarked July 21, 1915. Addressed to Mrs. Lena Seeley, Thayer Iowa. Saluation is "Dear Mother". Signed Majorie. Birch Street Residences at 9th and Birch, Atlantic, Iowa. 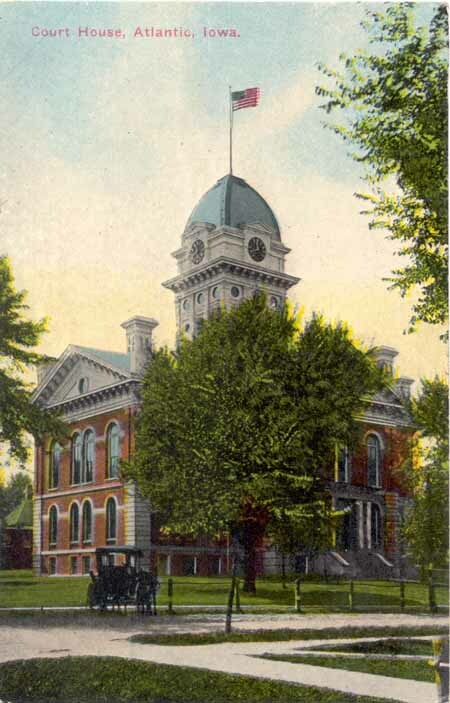 Divided back post card; postmarked 1909. Addressed to Miss Mabel Bailey, Havnhill, Mass. and signed Sarah. 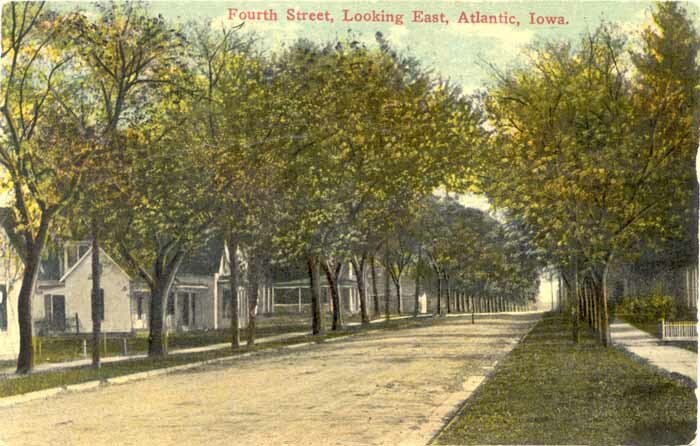 Fourth Street, Looking East, Atlantic, Iowa. Divided back post card; postally unused. Court House, Atlantic, Iowa. Divided back post card, unused, circa 1907-1915. Court House, Atlantic, Iowa. 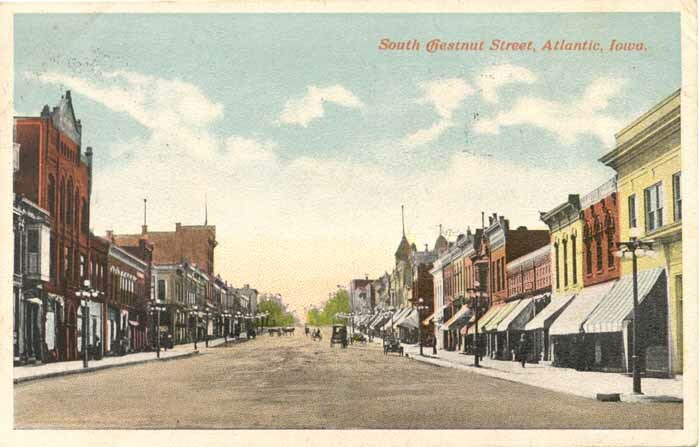 Divided back post card; postmarked 1910. 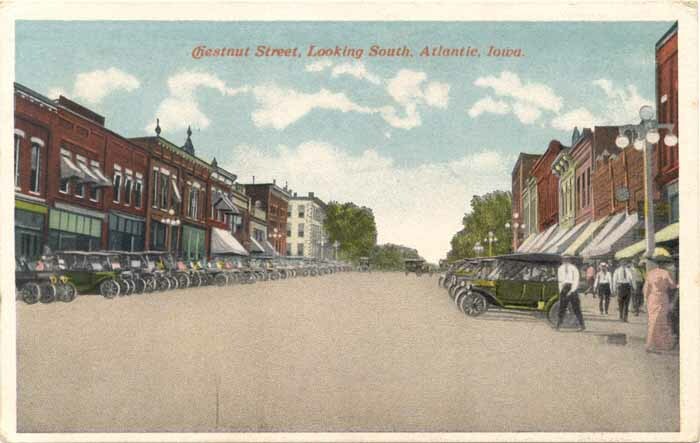 Post card is stamped "The Egbert Photo Post Card Co. Atlantic, Iowa". Scene at Rock-Island Bridge. 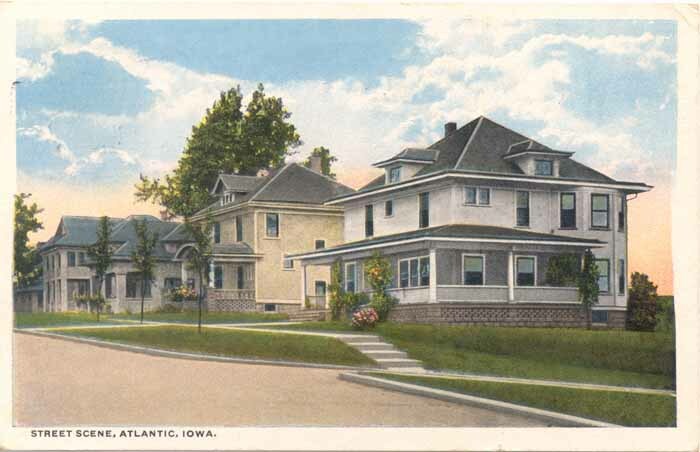 Atlantic, Iowa. Marked "Copyright 1909 Egbert Photo Postal Card". Photo postcard contributed by Pam Fratus, October 2009, from her grandmother's collection. 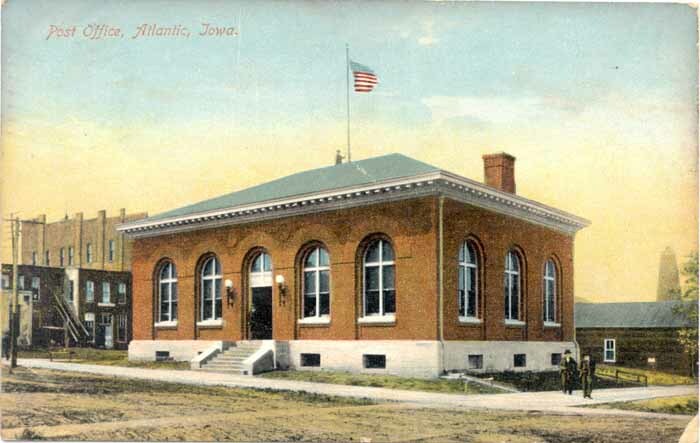 Post Office, Atlantic, Iowa. Divided back post card; postmarked 1910. Addressed to Miss Alvina Behrend, Wausa, Nebraska and signed Emma. Unless otherwise noted, post cards are from the collection of Cheryl Siebrass, May 2009-October 2010. 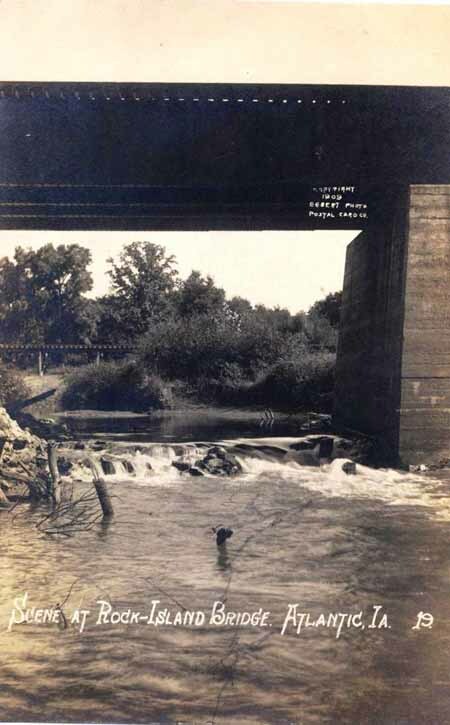 Do you have any historic postcards/photos of Cass County towns that you could contribute? We'd love to add them! Please contact the Cass County Coordinator.